Water inlet valves, also known as water fill valves, control the flow of water to and from a dishwasher during cycles. An inlet valve can sometimes become jammed in an open position if the solenoids that trigger the valve are not functioning properly. Solenoids can usually be tested for efficiency using a multitester. 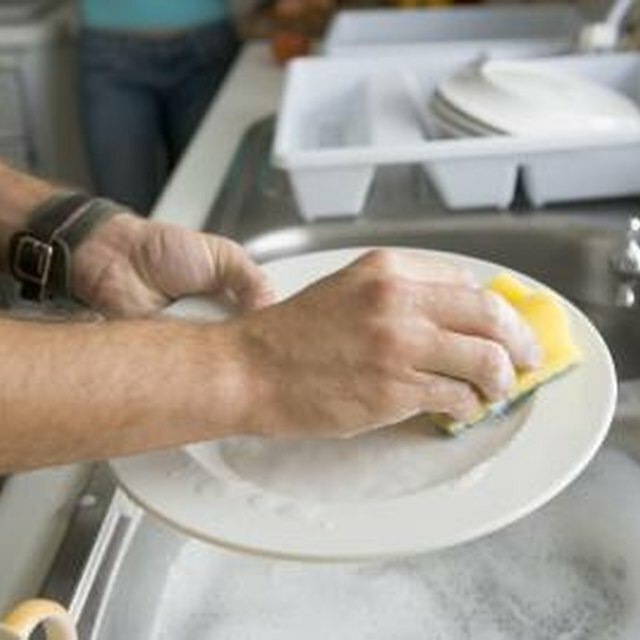 Dishwashers are a quick, efficient way to clean up after mealtimes. Water inlet valves are usually situated at the base of dishwashers behind a kick-plate panel on the left or right side. The panel comes off by using a screwdriver to remove the screws that attach it to the dishwasher. The dishwasher door itself must remain open to gain access to screws that hold the control panel in place on some models of dishwashers. The dishwasher door should be should shut again, however, before the kick plate is taken off. The water inlet valve usually has two hoses attached to it: one for running water from the house water supply and another that carries water out of the house. Dishwasher overflow problems can often be caused by kinks or abrasions in hoses rather than a fault with the inlet valve. The hoses should be securely fitted to the inlet valve so no water can escape during a dishwasher cycles. Solenoids are electromagnets used to provide motion to the metal armature situated in the dishwasher tubing. The solenoid’s actuator is responsible for controlling the water supply through the inlet water valve by opening and closing it as required. Some dishwashers have dual solenoids, which have separate wires attached to them to control water flow. Water inlet valves can be tested for efficiency using a multitester. By attaching the meter’s probes to a terminal, you can determine whether the inlet valve is stuck open. A reading of infinity usually indicates the valve is open and not controlling the water flow efficiently. This test can be carried out without removing the water inlet valve itself. However, ensure there is no power running to the dishwasher before attaching the probes. Achieving the correct readings on a multitester indicates the solenoids are working efficiently and that the inlet valve is not stuck in an open position during normal cycles. However, the valve itself should be examined too. Debris stuck in the valve or a tear in the valve can result in leaks even if the solenoids are opening and shutting the valve correctly. Appliance 411: How Do I Test a Water Fill Valve?